We take great pride in using only the latest, top quality, durable and long-lasting waterproofing and deck coating systems and we are certified and approved applicator for most recognized waterproofing system found in the industry. If you have any question about any specific project, materials or new products. We'll be happy to discuss any of your waterproofing or deck coatings needs. Please see below for further details. For a quote or more information, please Contact Us. Please visit our supplier's web site for our specifications, just click the link below. 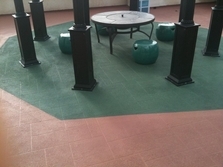 WATERPROOFING SYSTEM, BELOW GRADE WALLS, BASEMENT WATERPROOFING, UNDER TILE WATERPROOFING, BETWEEN SLAB WATERPROOFING, DECK COATING, PEDESTRIAN COATING, FLOOR COATING, PARKING STRUCTURE & GARAGE COATING, ROOFTOP COATING, CHEMICAL RESISTANT COATING, ELASTOMERIC COATING, VEHICULAR COATING AND EXPANSION JOINTS. Please contact us for specific recommendations, refinishing techniques and manufacturers maintenance guide that, if followed will help keep the coating and the treated surface functioning for the expected lifespan.